CHICAGO – The happening is lovelier, the second time around. Chicago film power couple Rebecca Fons and Jack C. Newell bring back “Destroy Your Art,” an event in which a filmmaker creates a film, shows it once to the audience, and then destroys it forever. Destroy Your Art takes place on August 10th, 2018, at Silent Funny Gallery in Chicago. For more information, including tickets, click here. “Destroy Your Art” will feature five filmmakers – Lydia Fu, Vincent Singleton, Deja Harrell, Jacquelyn Jamjoom, and Andrew Stasiulis – as they show their seven minute or less short films. After that ONE SHOWING, the films will be destroyed forever, never to be seen again. The concept challenges the notions of permanency, images, expression and our perception of what time means. Audience participants, and the filmmakers themselves, will be the only witnesses to the final products, before they are gone forever. Married couple Rebecca Fons and Jack C. Newell are one of the most prominent art and film pair in Chicago. She is the former Education Manager for the Chicago International Film Festival, and owns the Iowa Movie Theater (with her mother Marianne) in Winterset, Iowa. Jack C. Newell is a prolific movie director – who is also the Program Director of the Harold Ramis Film School at The Second City – and released his acclaimed documentary “42 Grams” in 2018, as well as being a facilitator of the “Wabash Lights” art installation in Chicago. He also has his latest directorial effort, “Hope Springs Eternal,” releasing on Friday, August 10th, 2018. In PART ONE of the Podtalk with Rebecca Fons (via phone) and Jack C. Newell, with Patrick McDonald of HollywoodChicago.com, the duo talk about the “Destroy Your Art” event concept in its second year. In PART TWO of the podtalk, Rebecca observes her first year as a theater owner, and Jack talks about different dynamics of art creation. 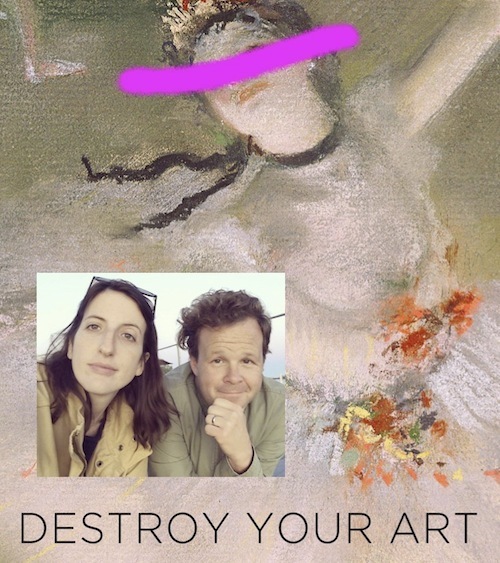 “Destroy Your Art” – hosted by Rebecca Fons and Jack C. Newell – will take place at 8pm on Friday, August 10th, 2018, at Silent Funny Gallery, 4106 West Chicago Avenue, Chicago.